Whether you adopt a purebred puppy, a “designer” breed, or the mutt next door, the first thing you’ll notice is the puppy's coat type, color, and pattern. This fur coat can change as the dog matures, so it’s a good idea to know what to expect when the dog grows up. The coat type varies between breeds, and it impacts the amount of fur shedding and grooming care needed. Smooth Coat: Smooth coats require the least amount of grooming, but the dog's fur coat can't be neglected. The hair lies close to the body, such as on a Dachshund, and needs to be bathed and brushed regularly, though not as much as some other types of fur. If your smooth-furred dog sheds a lot, use a de-shedding shampoo to stem the problem. When you brush the dog, use a bristle brush first against the lay of the hair, and then repeat it going with the lay of the hair. A pin brush can help remove the dander from the dog's skin and keep the fur shiny. After the pup has been bathed, using both shampoo and conditioner to keep that coat nice and shiny, towel-dry him and let the hair air-dry. Double Coat: Dogs with a double coat, such as Newfoundlands, have a soft undercoat that provides insulation and a tougher top coat that repels water and shields from dirt. Because of this double-coat, which can be short- or long-haired, they need a little bit more grooming than dogs with other types of fur. First, use a slicker or pin brush when starting with the undercoat on short-haired double-coated dogs. Brush outward from the skin, and then brush with the lay of the fur on the top coat. With long-haired dogs, take your time brushing out sections of the dog's coat. You might consider using an undercoat rake to really get those tangles undone. Start by brushing outward from the skin to wiggle stray hairs loose. Next, use a wide-toothed comb to do the same to the undercoat. There might be some knots, so use a detangler to get rid of them. Finish up by brushing the top coat, and then bathe with both shampoo and conditions. Long Coat: Longer fur on dogs such as German Shepards demands combing or brushing on nearly a daily basis, especially during shedding season. Long coats can be coarse or silky, but for either one, use a detangling shampoo when bathing your dog to avoid any pain. Long, coarse coats have a soft undercoat that needs to be brushed with a pin brush and a smooth bristle brush. Silky haired dogs, such as Setters and Spaniels, don't have undercoats, but there's still a risk of tangled in the fine hair. During a bath, use conditioner to add strength and shine to the dog's fur. If possible, dry the dog's fur with a hair dryer after bathing and then do another brush-out of the coat. Wire Coat: A number of terriers, as well as Irish Wolfhounds, have wiry coats that are susceptible to tangles. Wire coats, also known as broken coats, need both a stripping comb and a slicker brush when grooming. 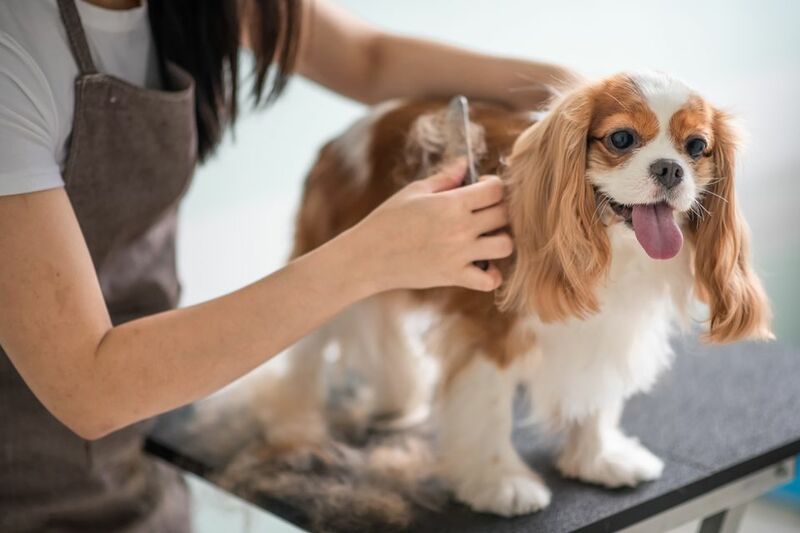 Use the stripping comb to thin the fur by running it lightly along the dog's back, using a detangler to get out mats, if necessary. Follow up the thinning by brushing the fur out from the skin with the slicker brush. Consider bringing a wiry-coat dog in for professional grooming, as it's not an easy task to master. Curly Coat: Curly-coated dogs, such as Poodles or Bichon Frises, have thick, soft curls that rest close to the body. Keep the curls trimmed, as they grow fast and can become tangled. When brushing, use a soft, curved slicker brush against the lay of the fur in order to make the coat fluffy. During bathing, use only shampoo, as conditioner can weight the fur down and making it harder to clip. After a bath, first towel-dry and then blow-dry the fur, and then follow it up with brushing the coat from the skin out.